What's in a name? And, can it make a difference to the success of a recording artist? This week in 1988 was a good one to ponder those questions, since among the breakers and new entries on the ARIA chart that week was everything from literal band names to stage names to a pretentious artsy band name. Oh, and one song we'll recap from this week in 1988 was actually released by a singer using their birth name. What a novel idea. On top of the singles chart, Fairground Attraction (named, presumably, with a safe and pleasant ride like a merry-go-round in mind, rather than a thrilling roller-coaster) ascended to the number 1 spot with "Perfect". In the process, they knocked off "Age Of Reason" by John Farnham, who'd once gone by Johnny, since, presumably, it made him more endearing. Given the success of "Sweet Little Mystery", Wet Wet Wet's Australian record company decided to give the Scottish band's debut single another whirl with limited reward. The single that broke Whitney Houston's string of consecutive number 1 hits in the US - she had seven in a row before this - also became her first not to reach the ARIA top 50 since "You Give Good Love". Also missing the top 50 with their latest single was Australian pop/funk outfit Rockmelons whose latest release from Tales Of The City once again featured the vocals of John Kenny. Imagine if Australian bands followed the US tradition of naming themselves after the city in which they were formed. Silverchair would be called Newcastle, Savage Garden would be Logan City and Eskimo Joe would be Fremantle. MOR stalwarts Chicago came together in the late '60s in the city of the same name - and the band members were clearly so unimaginative that most of their albums were also called Chicago. By 1988, they were up to Chicago 19, and this power ballad was the first single lifted from that album. With vocals handled by keyboard player/guitarist Bill Champlin, the track reached number 3 in the States but missed the ARIA top 50. With "Fast Car" still inside the top 20 and her self-titled album selling solidly, everyone was talkin' 'bout Tracy Chapman in 1988 - but that didn't mean she could score another hit single. In fact, the folk singer (who recorded under her birth name) wouldn't hit the top 50 again until 1995, but when she did, it would be with another monster hit. Meanwhile, "Talkin'..." would improve on its 1988 peak by one position, when it reached number 66 in 2011 following its performance during that year's The X Factor auditions. Split Enz had originally been called Split Ends, and while one spin-off group, Crowded House (initially called The Mullanes), were doing very well indeed in 1988, the group launched by Neil Finn's predecessor in Split Enz, Phil Judd, didn't manage the same chart highs. Taking their name from the German for "quick window" - why? Because it was quirky - Schnell Fenster also featured former Split Enz members Nigel Griggs and Noel Crombie in the line-up. But, just as Phil's era of Split Enz was less commercial, so too was this group when compared to Crowded House - and despite Single Of The Week billing on the chart, "Whisper" missed the top 50. Born Ernest Evans, Chubby Checker was the Los Del Rio of his day, responsible for the start of dance craze The Twist. The accompanying single (and the first of a few Twist-themed tracks Chubby released) was recently named as Billboard's all-time number 1 record, mostly due to the fact that it reached the top spot in the US on two separate occasions - in 1960 and 1962. Nearly three decades later, rap trio The Fat Boys teamed up with Chubby for an updated version of the track, which was particularly big in Europe. "The Twist (Yo, Twist!)" followed a previous cover version of The Surfaris' "Wipeout", which had featured The Beach Boys on backing vocals. 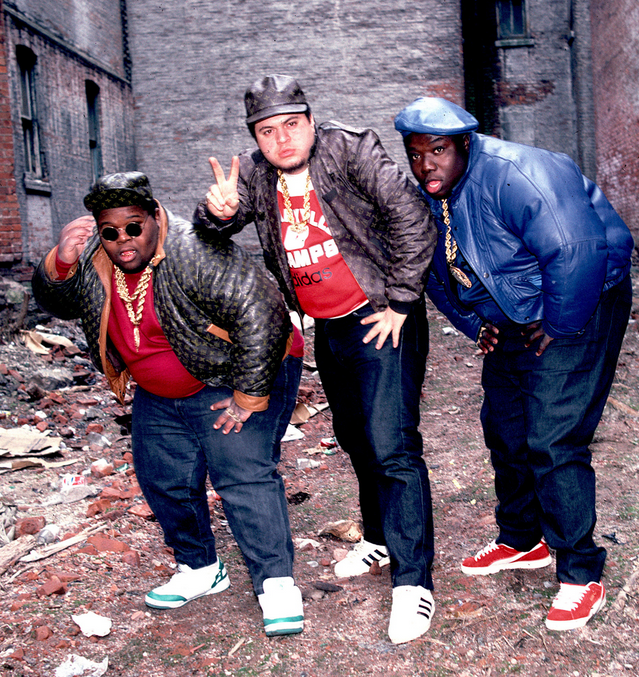 Given their size, it's obvious where The Fat Boys got the idea for their name, but the individual members' names are quite something. Probably the most famous member is Prince Markie Dee (real name: Mark Morales), who had a solo career, and became a songwriter and producer after the demise of the group. Then, there was Kool Rock-Ski (real name: Damon Wimbley) and the late Darren Robinson, otherwise known as Buff Love (aka The Human Beat Box). Got all that? I wonder whether the sudden arrival of this British club hit on the ARIA top 50 was due to people buying it by mistake, thinking it was "that Doctor Who song". Or, whether the runaway success of "Doctorin' The Tardis" resulted in more people discovering the inspiration for that track's title. Coldcut are duo Matt Black and Jonathan More, who, alongside The Beatmasters, made a name for themselves with a series of dance tracks featuring guest performers who'd go on to bigger things in subsequent years. In this case, the featured singer was Yasmin Evans, who recorded under the name Yazz. We'd hear more from her by the end of the year. This week's biggest entry came from the man born Georgios Kyriacos Panagiòtou, who changed his name to the more anglicised George Michael ahead of his career as a pop superstar. "Monkey" was yet another number 1 single for George in the States (his fourth on the trot) and dealt with the topic of drug addiction - the "monkey on your back" of the song's lyrics. Next week: an Aussie legend and a brand new homegrown band arrive with new singles, as well as an international singer who found an appreciative audience (and eventually a home) here in Australia. Before that, I'll conclude my countdown of my favourite songs from 1996. Don't think I'd heard the Wet Wet Wet track before. It sounds surprisingly 'dark' for them. I only heard 'Love Will Save the Day' through American Top 40 back then; no doubt not having a proper video didn't help its chart success. 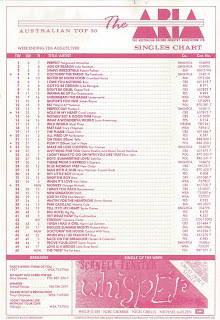 'Talkin' 'bout a Revolution' received a fair amount of airplay in Victoria. I guess people who liked it bought the album instead. I don't think I'd heard the Scnhell Fenster track until buying the 1988 What's Hot compilation album. Your assertion that people may have bought the Coldcut single mistakenly believing it was the similarly-titled Timelords' one may be correct, but I heard/saw the Coldcut track first (on Cartoon Connection, I believe, before school one day), so it did get some exposure. 'Monkey' was probably my favourite single from 'Faith', though seems pretty much forgotten now.